(Note: If you are not familiar with dog agility terms, please refer to our agility dictionary to translate terms used in the following story). Miles and I are beginners in the competitive sport of dog agility. Over the last year, we have trialed at a variety of venues. Compared to a lot of other teams, we waited a long time to begin trialing, because, as is well documented on this blog, Welsh terriers are very difficult to train. They like to think for themselves, and they like to do what they want to do. This mindset is not automatically ideal for the sport of agility — which combines all of the speed of the dog, with the intent of channeling that vigor into a highly controlled sport, that is held in very exciting environments. Now, it is always a risk letting even the best trained Welsh terrier loose into a relatively open space with many other dogs and lots of activity all around. It takes a strong person to take on this challenge, and a person that is willing to work extremely hard. Thankfully, our hard work together has allowed Miles to compete well, even when the only thing between us and everything else is a thin stretch of widely woven plastic netting around the ring (example here). The places we typically compete also have open walkways for going into the ring, and out of the ring. And many dogs make the mad dash out of the ring at either end. But amazingly, not Miles. Never Miles. …There is no mystery when Miles can easily see out of the ring. He doesn’t leave the ring, because he knows what is outside. When the barrier is transparent, so are the temptations outside. Yes you know the punchline now, don’t you?! The course in question was a Gamblers course that we happened to be running, and, unfortunately for us, we were the second team to enter the ring. Gamblers is a willy-nilly sort of course, where you tear around madly racking up as many points in the opening as you can. The dogs have a lot more freedom in the opening of this course, because accidental extra obstacles add points. In a Gamble course, handlers tend to be less uptight about following their plan as strictly as they are for, say, a Standard course (where one extra obstacle equals a no-Q!). We entered the ring, and Miles followed my plan, completing seven obstacles in great time. We had enough points, woohoo! We still had time before the buzzer rang for the closing gamble, so I thought, heck, why not get some extra points by sending him over the A-Frame? So I did. Miles climbed the A-Frame, which was lined right smack up against the barrier, which extended only halfway up the A-Frame. He took a moment to look into the other ring, which he had a perfect birds-eye view of. A Masters team was running, a woman and a fast Weimaraner. Everyone that day had complained about the A-Frame being lined up against the barrier, because, when your dog goes up, like Miles, they could look right into the other ring. Many dogs that morning had paused to take a gander, and had lost their runs due to the wasted time. But, Miles isn’t most dogs. He doesn’t waste time daydreaming about what could be — he problem-solves, and he strategizes. Terriers don’t dream – terriers make it happen. And little did I know, in his single second pause on the top of the A-frame, Miles had come up with a plan. The whole thing happened in about 3 seconds. 3 seconds can be pretty eventful. Typically, a dog that loses control and/or leaves the ring is eliminated. But due to the size and placement of the gap (it being directly into the other ring, being so wide, etc), the judge granted us a re-run — deeming it not our fault. I don’t remember the re-run at all. I’ll admit it, it was tough walking past the many people throughout the day who made jokes about the wild show we put on. I took a long walk with Miles, and we regrouped. I ate my lunch alone in a sunny patch of grass with Miles. I took a deep breath. We went back in, and on our next run, we busted out the best Snooker run of our career — and got an Advanced Snooker Q. Miles must have known it was time to pull out all of the stops. Miles had run off for the first time. And not in one of the many venues with flimsy string barriers that we’ve been to. Not in the places I was worried about. No. When I least expected it. Why? Because, those open places hold no mystery. But a thick impenetrable barrier with an opening at the end? Now that is the likes of Alice in Wonderland to a Welsh terrier. A straight out rabbit hole. Terriers live for the mysterious passageways into exciting and dangerous new worlds. While most of us fear dark and unsure passageways — terriers instinctually are driven to seek them out and dive in, head first, with no fear. They were bred to dive straight into dark narrow underground holes in pursuit of game, knowing full well that they might get mauled by an angry badger in the claustrophobic dark depths below ground. Nothing is as irresistible as mystery to a terrier. 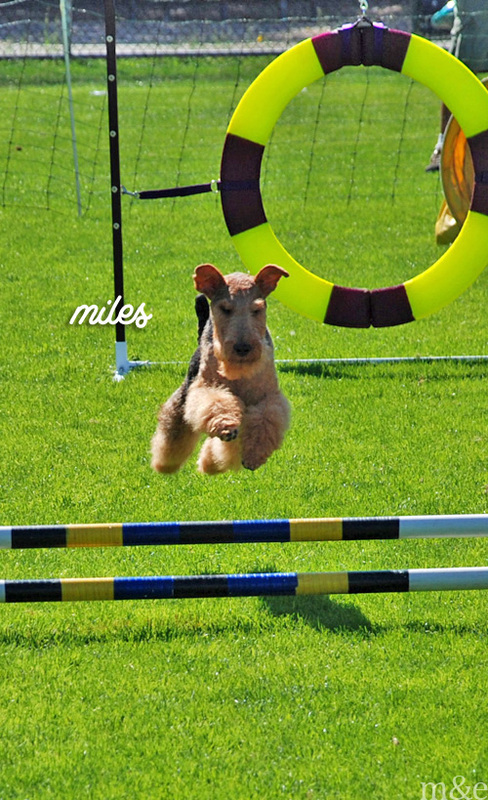 Running a Welsh terrier in agility takes a strong person to take on the challenge, and a person that is willing to work very hard. …And, a person who can handle their human pride being eaten, digested, and excreted by a dinosaur gut, from time to time. I have a friend whose Scottie who did that once, we all got a kick out of it. Terriers are not for the prideful! Thank you Darcy! That helps. This is so funny! I’ve never thought about it before (and Robin is far from a terrier) but he’s obsessed with peering down these steel gutters placed every so often along the trail. Never interested in the regular open edge, but the gutters fascinate him. Must be the same kind of fascination with a limited view.